It's been a rollercoaster first week for the 'Orrible Eat-A-Thon Card Game. We've managed to raise a whopping 50% of the funding goal and now have 3 weeks to find the other 50%. Sounds easy right? Not quite! All our lovely friends, familly and fans have got their pledges in, but unless Kickstarter decides to bump us up the rankings anytime soon, it's up to us to keep getting people to the gobbo's Kickstarter page and backing the game. We've got lots of fun things planned to keep getting the word out (events, live streams, votes, competitions) but we need your help too! Keep on liking and sharing those posts and tweets. Tell your friends, your family, your neighbours, your dog about the campaign. 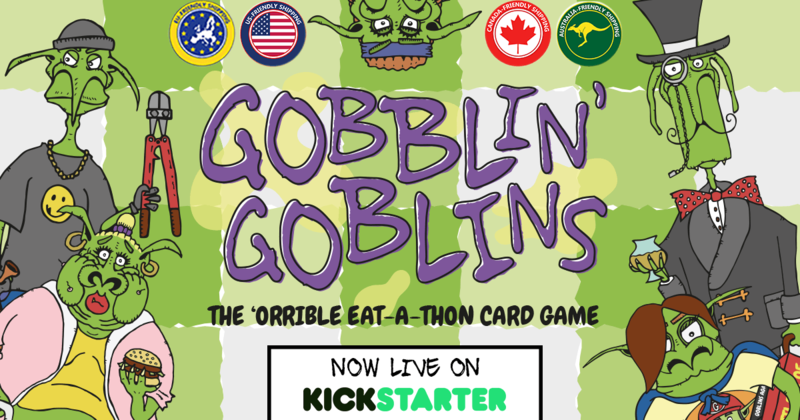 Get naked, paint yourself green and run out into the street shouting "GOBBLIN' GOBLINS NOW ON KICKSTARTER!". OK, maybe not that last one. But you get the gist! Kickstarter Livestream: Tomorrow night we will be live streaming some games of Gobblin' Goblins on Kickstarter! If you're a backer whose never seen the game in action, this is a great opportunity to see what your getting into! Worlds Away - International Games Week Special: We will be demoing the goblins at Bournemouth Library on Saturday, and we won't be alone! You can also try out recently funded game Forest of Fate and another awesome game in the making Tranqui Veil. Find out more details about that event here. Launch Event at the Four Horsemen: This was an absolute blast! Thanks to everyone who came down and helped celebrate the launch! Big Red Barrel's Tabletop Tuesday at Loading Bar, Dalston: Another amazing event! If you're looking to get your Kickstarter game out into the the big wide world I can't recommend this enough. Get in touch with the lovely Tim if you are interested. Find out more here. That's all for now folks, thanks for all your support so far! Let's see how week 2 goes. The goblins have all 16 of their fingers and toes crossed.